When I first started my blog, I had no idea what I was doing. I knew that I wanted an outlet. I needed a hobby. I was a new stay at home mom and frankly, I was going a little stir crazy. I didn’t start blogging to make money or work with brands. I started it to document my thoughts and hopefully speak to at least one reader and help them through the things I have been and will go through. I had NO idea my blog would be as successful as it is. I had no idea that anyone other than my mom would read it (thanks mom!). I never dreamt I would work with brands that I use and love and actually get paid to do what I love everyday. I had no idea the amazing community of bloggers that is out there and the great friends that I would make when I started blogging. If you’ve been reading my blog for anytime at all, you’ve noticed in the past week we’ve undergone a few changes. I re-designed and re-branded everything, an idea that has been in the works for months. Over the past few months, I’ve also added a new category to my site: blogging. I have had so many requests from new bloggers or potential bloggers about how to start a blog, how to grow their blog and how to find their voice- that it’s really been pulling at my heart strings lately to start sharing some information with my readers about blogging and what all goes into it. 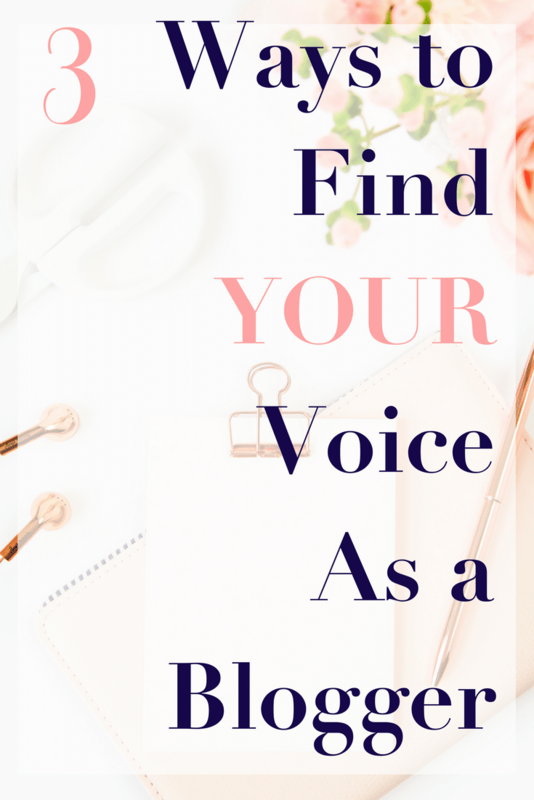 Today, I want to chat about finding your voice as a blogger. Finding your voice as a blogger is tough. There are a gazillion blogs out there. When I first started I had doubts (honestly, sometimes I still do), would anyone read it? Could I only write about parenting? What about my favorite recipes? Travel? In the past few months, I feel like I have finally settled into a routine and have found my voice. I know what I enjoy writing about, what challenges me, what my readers like to see and what is near and dear to my heart. So, I write about all of those things. I feel like there are 3 things that have really helped me to find MY voice as a blogger and I hope they help you to find YOUR voice. This can be a private board on Pinterest, a word document, a good ole fashioned cork board with photos cut out of a magazine…whatever works for you. Personally, I use a secret Pinterest board. This board is where I pin things that inspire me, make me think and challenge me to grow. Every few weeks, I go back and scroll through that board if I’m feeling a bit of writer’s block or if I just need to get back to ‘my’ voice after a busy few days. If I could only write about one subject, what would that be? Am I an expert in anything? If so, would that information be something I want to share with others to help/encourage them? What topics do my friends and I talk about frequently? What makes me excited to wake up in the morning? Asking yourself all of these questions will help you to find your voice. You will likely see that there is a common theme or answer for some of these questions. Start there, write about what you enjoy to do. Yes, blogging can be lucrative, but I am a firm believer that the money doesn’t come unless you truly love what you are writing about and have a passion for it. Find your voice first. I know, you’re probably rolling your eyes. I’m serious, though. Be you. Your readers will see through you if you aren’t. Being a blogger means being open and sharing pieces of your life and possibly family that some aren’t comfortable sharing. People want honesty and if they can trust you- they will trust your brand and blog. Trust=repeat readers. A prime example of this that I struggled with recently was during my re-brand. I started looking at color templates, etc. and thinking “what looks the best to my readers?”, “what if someone else has these colors?”, etc. Last week I realized, it doesn’t matter! Sure, you want a user-friendly site and an aesthetically pleasing site, but you need to love your brand first. When I realized that, I realized that I was looking at my re-brand all wrong. Pink is my favorite color. I love golds and metallics…and you see the new site! I stayed true to myself and what I love and in turn, am building my brand around that. If you are a blogger or are interested in starting a blog, I would love to talk with you. I am excited to announce, I am now offering on a very-limited basis- blog coaching! If you aren’t sure where to start, how to grow your social media or if you even want to blog-I would love to chat with you! Coaching starts at $75/month. If you are interested, please complete the contact form and I will be in touch as soon as a spot opens up! Love this. I have just started hearing about mood boards for branding as well as for finding your style. It’s been incredibly helpful to me. I remember when I first started blogging. I was in fifth grade and my mom was a blogger. I had no idea what to write about. For the most part those early blog post are cringe worthy. I so agree with you about the inspiration board. I have a secret Pinterest board as well that really serves as a way to jumpstart my creativity when I need it. And by the way your site looks great! These are really excellent tips. Finding a voice can be difficult when you’re not sure what your niche is and who your followers are. I like that part about using what excites you as inspiration. This is really awesome. I wanted an outlet as well and I am enjoying what I do especially since blogging has helped me through a lot and I get to work with brands that I like. Yes, it really does help you through things also! This is a good guide for new and old bloggers. It’s all about finding what you want to write about. I think this is awesome. These are great tips! I think it’s really important you find something you’re passionate about and make sure you stick to that as well. For us, it’s SeaWorld. And although it’s taken quite a controversial turn, we’ve stuck through it and it’s been a very personally rewarding journey with a lot of learning opportunities along the way (both there as well as here on my blog). That is so true, finding your passion is so important and you are right- not everyone will agree with it! Great post!! I love the idea of making an inspiration board and those are some great questions to ask yourself to help find your voice! It’s so important to write about the topics that really make you passionate. I completely agree with all of your advice.